Every year, one in three adults age 65 and older falls, according to the U.S. Centers for Disease Control and Prevention, and 20 to 30 percent of them will suffer moderate to severe injuries as a result. To make aging in place — remaining safely at home at any age — easier and more secure for seniors, caregivers and family members should consider safety planning combined with today’s advanced independence tools. I’ve experienced firsthand what can happen when a parent falls — how frightening it is, and how much time is then spent traveling between hospitals, rehabilitation and nursing homes. Our goal is to help others be proactive about safety planning and to help seniors remain in their homes as long as possible, in a safe and secure environment. My Health Phone, a no-contract cell phone that allows seniors to communicate with caregivers and have access to 911 while at home or away. 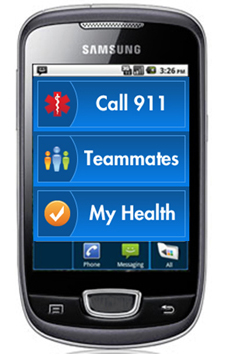 It allows elderly loved ones to check in via calls, text messages or e-mails. The device can also be programmed to deliver medication reminders and store electronic copies of living wills, HIPAA releases and medical directives. The My Health Phone is a Samsung Galaxy Mini touch-screen model with GPS and a 3-megapixel camera. Costs include a one-time equipment and activation charge and a monthly charge for service. Stander mobility products provides tools for independent living. Floor-to-ceiling security poles and curved grab bars can be installed anywhere in the home, and are handy in bathrooms, a room that can be especially dangerous to seniors. Other Stander products include bed rails, crutches, couch canes that offer a helping hand while to sit or stand, and CarCaddie portable handles for getting in and out of vehicles. The Philips Lifeline medical alert service is a base and wearable pendant that lets seniors call for help at any time of day or night. The pendant is waterproof, always charged and stays within reach. There are no equipment or activation fees at time of publication, but there is a monthly service fee. The CareGiver Partnership offers customers who sign up for Philips Lifeline a discount off their next order. I personally review all the brands and products we carry to ensure they offer the latest technology and excellent service, then arrange discounts to our customers whenever possible. The CareGiver Partnership offers a free guide to preventing falls by staying healthy, making a home safer and taking advantage of personal safety tools.